I worshipped my grandfather. At first it was the way he looked at me with unabashed delight, later it was for the way his skin creased like a blanket, and whiskers grew, but never hurt my face when he kissed me. Later still it was the careful consideration he gave any topic I asked about—homosexuality, abortion, racism. He listened to me in ways that other adults didn’t. He sent me sermons and passages from scripture, offering religion-based support for my positions or, if not that, then examples of how the Bible did not support the opposing view. Several times a year I search his name, sometimes with a key word, other times not. I take solace in knowing that so much of his teaching and writing is still relevant today. I miss him less and more each time. Discovering this prayer for Martin Luther King was no different. Today I offer it as so many are remembering great man even as we wonder how we haven’t come farther since he worked so tirelessly and fearlessly. More than 2000 people walked in the March of Sorrow in memory of King. Eternal God, Lord of life and death, to whom black and white are alike, to whom man is man. … we confess that the words of conventional piety escape us now, that we cannot honestly say, except in irony, Thou hast given, take thou away; blessed be thy name. We protest with they servants of old, Jeremiah and Job and Habakkuk, that thou hast engaged us in an unequal contest, and thou, Giver and Taker, hast prevailed. But we protest in thy presence, and in thy hearing, and with such faith as in thy grace thou givest us. If we are outraged, or cynical or bitter in our loss, or frightened, or in despair, we are nevertheless grateful to thee, the author of life, that Martin Luther King was; that as long as we who admired him, loved him, believed in him, rejoiced in him— as long as we live, he is; and that indeed, in his own faith and that of many of us here, he may yet be, in thee, in thy life, in thy love. We who are white acknowledge in shame our white apathy, brutality, arrogance, or indifference that makes us all participants in his death. At the same time, we acknowledge thy great goodness in this finished life, magnificently and courageously lived and now without bitterness surrendered. We thank thee for thy servant Martin. We thank thee for thy gift of his life, for all the short time in our years that he gave to all of us his own gifts of counsel and strength and unparalleled compassion. We commend to thy compassion his family and all those bound closely and intimately to him in love. For Martin Luther King, now taken from us all, we give thee thanks. 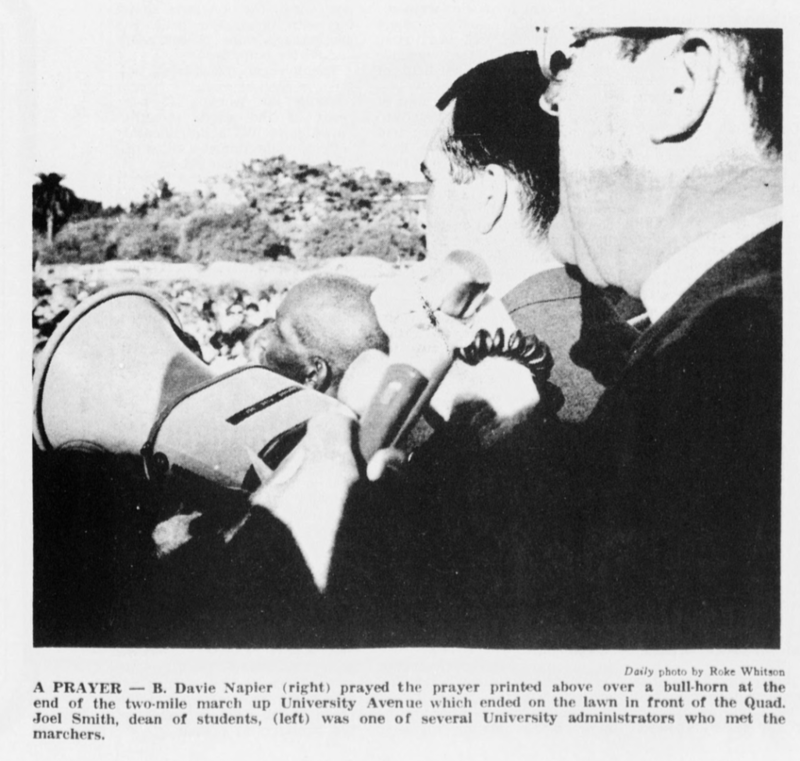 Daily photo by Roke Whitson A PRAYER — B. Davie Napier prayed the prayer above over a bull-horn at the end of the two-mile march up University Avenue which ended on the lawn in front of the Quad. 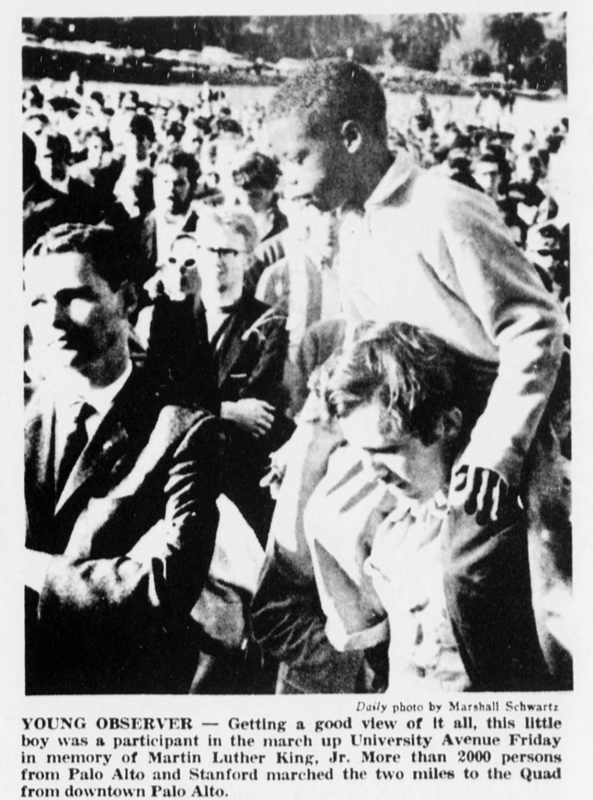 •Joel Smith, dean of students, (left) was one of several University administrators who met the marchers. 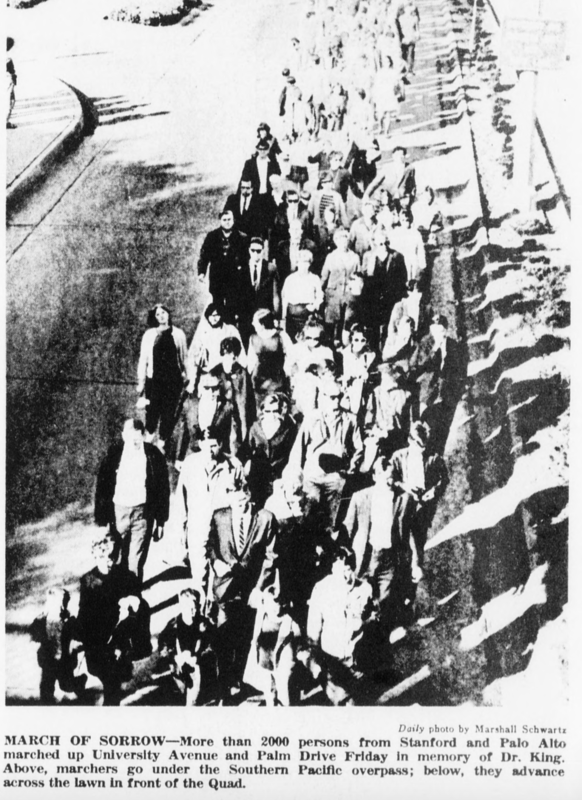 *Large passages of this post are republished from The Stanford Daily, Volume 153, Issue 36, April 8th, 1968.